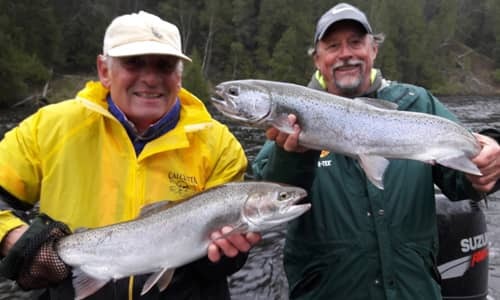 World Class Michigan Salmon Fishing Guides ~ Best Salmon Fishing Guides in Michigan. Join us for outstanding Trout fishing on Michigan’s Muskegon River. 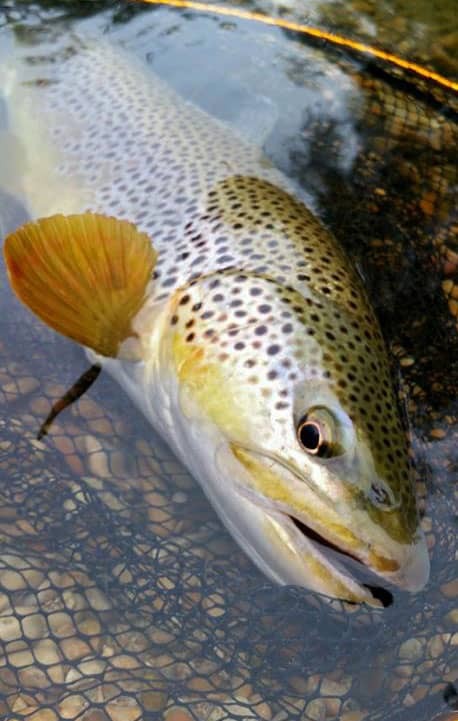 Come Join Us for Muskegon River Trout on light spinning tackle or fly fishing awesome hatches! We’re sure to get you on fish! Open Guide Dates: April: 25, 26, 27, 28, 29, 30. Incredible Spring Steelhead Fishing on the Muskegon River. Good Numbers of bright silver Spring Steelhead, Located in West Michigan. 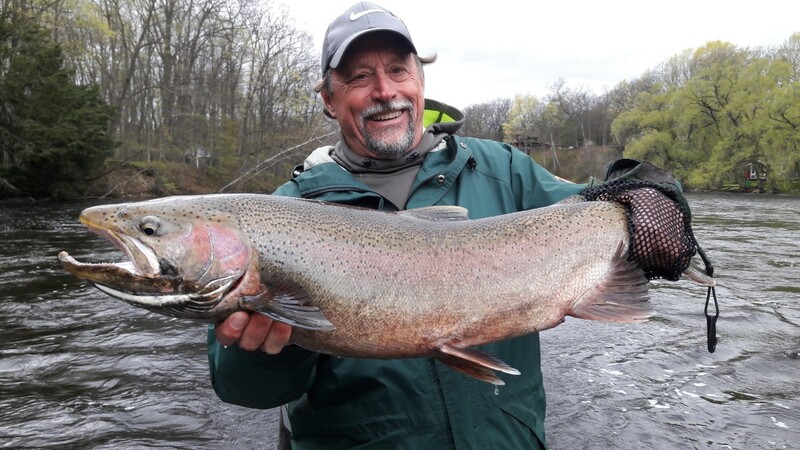 Spring Steelhead Fishing Guides for Michigan’s Muskegon River, Pere Marquette, and Big Manistee River. Guided Steelhead Trips are all Inclusive, Includes all the gear, tackle, rods, reels that you may need. Heck, We’ll even clean your steelhead for you! 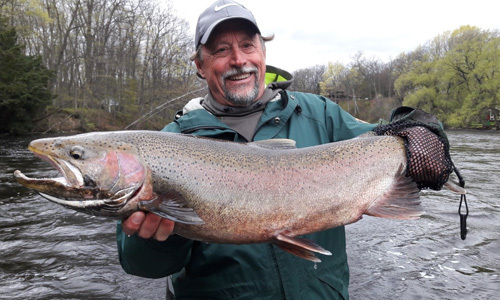 Michigan Steelhead Fishing – The upper sections of the Muskegon River near the Croton Dam to Pine Street Launch have been fishing very for steelhead. Spawning is in full swing right now with lots of steelhead visible and on gravel. Sight fly fishing for steelhead has been outstanding! Vicious strikes while watching the steelhead take the fly, has made for some heart pounding action! King Salmon fry patterns, stone flies, and green caddis, have all been working well for bright chrome Michigan Steelhead. Steelhead begin to key on stone flies. Stone flies and salmon fry are major food sources for both steelhead, brown trout, and resident rainbow trout. Salmon smolt also feed well on stone flies. Bead fishing has also been very good. Both 8mm and 10mm trout beads are fishing well this time of year. Natural colors, mostly orange, and peach have been fishing well. Most productive techniques have been bead fishing on light spinning tackle. Rolling spawn sacks along the bottom, or jigs and wax worms under a float (bobber fishing). 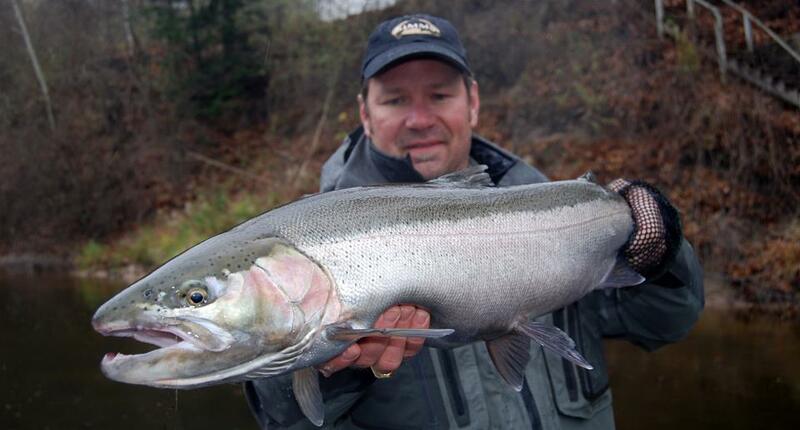 Fly fishing has also been very good for Muskegon River Steelhead. Drifting eggs and nymphs along the bottom has been producing some nice steelhead and brown trout. Premium flies tied on Daichii hooks. Chrome Fall Chinook Salmon – Pere Marquette. 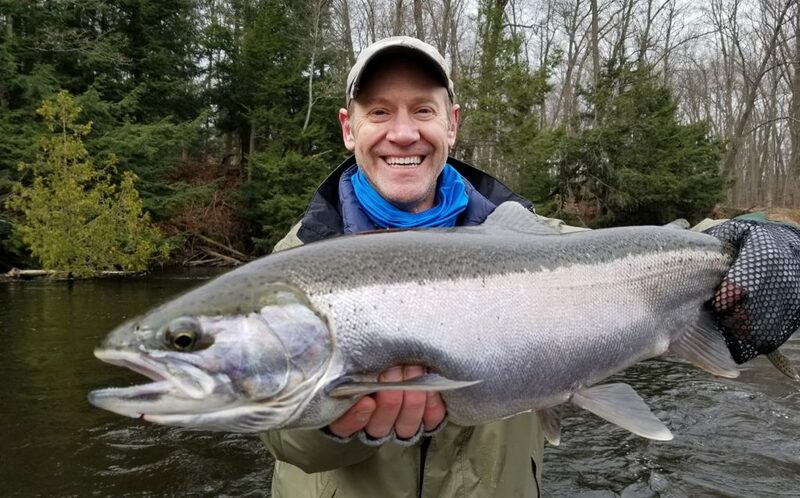 It won’t be long until chrome Chinook and Coho Salmon begin to ascend Michigan rivers such as the Manistee, Muskegon, Pere Marquette, and White Rivers! Fishing for salmon is one of highest volume guided trips. These fishing trips offer incredible angler opportunities for huge fish like steelhead and salmon. 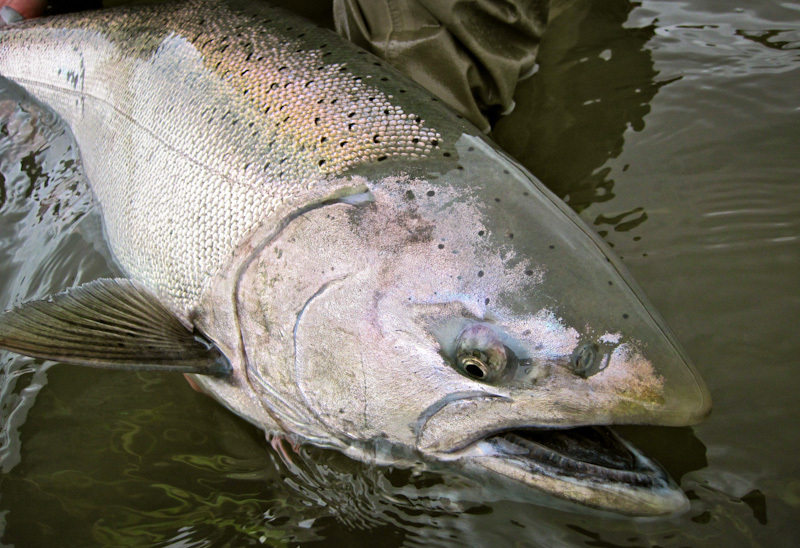 Prime Salmon dates are September, October, and November for Fall Steelhead. We start our salmon season fishing the lower end of the Pere Marquette River near Ludington. Early morning trips consist of casting Thunder stick crankbaits for King Salmon and steelhead. We also offer guided trips with spinning or bait caster tackle for floats (bobber) and skein (salmon eggs) trips. Center pin angling for salmon is also a blast during the early season. Center pin fishing for salmon. Fly Fishing brings us to the Big Manistee River below Tippy Dam. Hordes of salmon crowd this river in the upper stretches where anglers see salmon everywhere they look. Big numbers days are normal below Tippy dam near Wellston, MI. 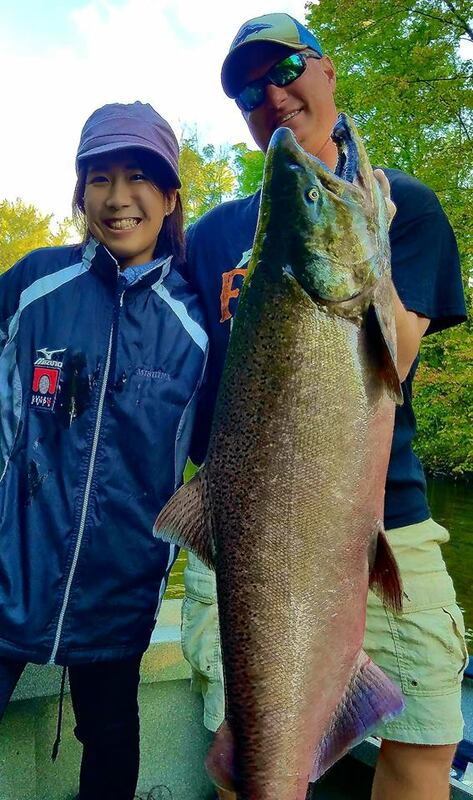 Best times for king and Coho salmon on the Muskegon and Manistee River are mid September through late October. Bead fishing for trout and steelhead can also be phenomenal at this time!! 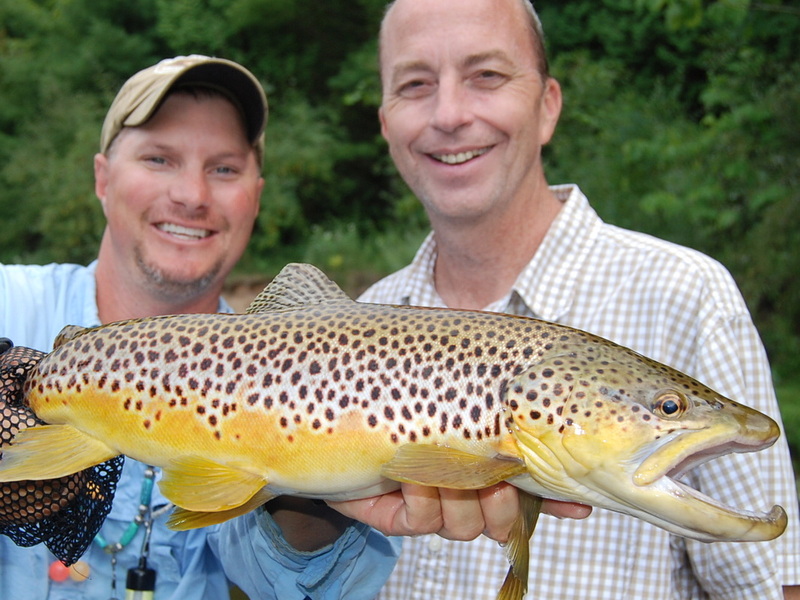 World Class Trout Fishing on Michigan’s Muskegon, Pere Marquette, and Manistee Rivers. 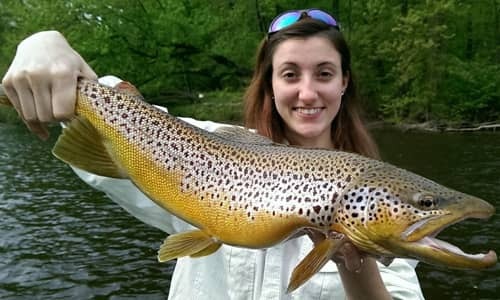 All inclusive guided Trout fishing in West Michigan. Dry fly fishing and hatch time is upon us! Muskegon River hatches such as the Gray Drake, Isonychia Bicolor, and Cinnamon Sedge Caddis are all going strong now. Hot and humid weather has put the trout fishing into over drive. Consistent hatches now in the evenings. Afternoon’s are offering the best Muskegon River trout fishing. 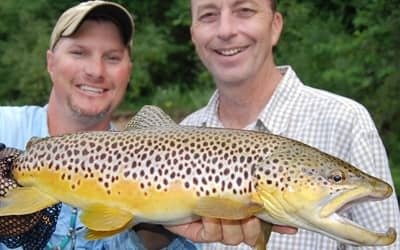 We offer both light spinning tackle, morning trips, and afternoon -evening Hatch Master Trout Fly Fishing Trips on the Muskegon and Manistee Rivers. All gear, tackle, and flies provided at no charge. Casting instructionals are also included in all guided fishing trips. We look forward to introducing you to some World Class Trout fishing! 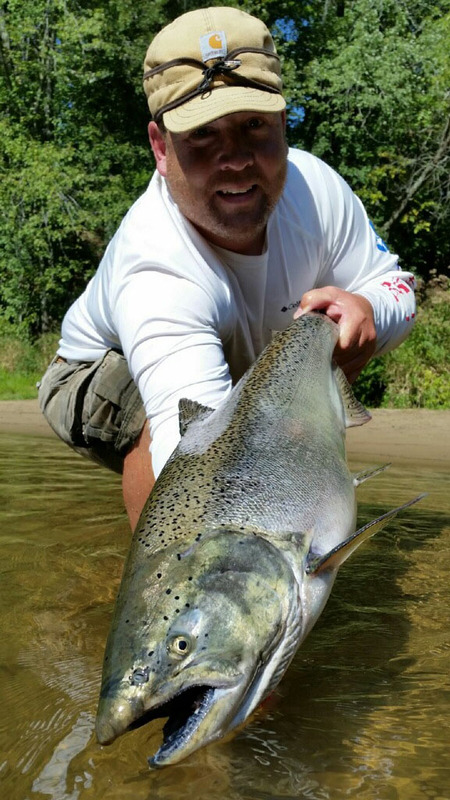 No other fish inspires anglers more than Michigan Fall Steelhead. 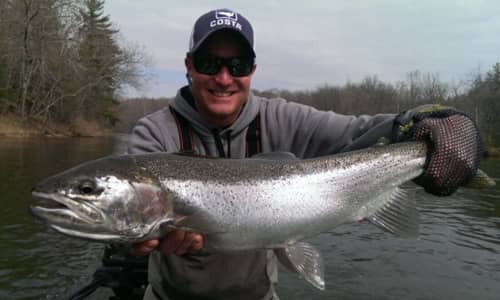 Known for their savage hits, spectacular runs, and exhilarating jumps, Muskegon River Steelhead are high on the list. Whether novice or expert, steelhead will put a smile on your face and a bend in the rod that you won’t forget! Our main focus now is Trout & Smallmouth Bass fishing at this time. The Muskegon River is at a nice level (1790 cfs) clear with water temps in the 60s. Large numbers of Salmon, Steelhead, and Sucker fry are present. Caddis are the prime hatch at this time. Muskegon River Trout feed heavily on Caddis and Caddis emergers all summer long. The native insects provide a staple food source for our resident Brown and Rainbow trout. Evening hatch fishing trips provide some great Trout fishing action for novice anglers. Casting instruction is included in all Hatch Master trips. Fly rods and flies are also included with the trips. 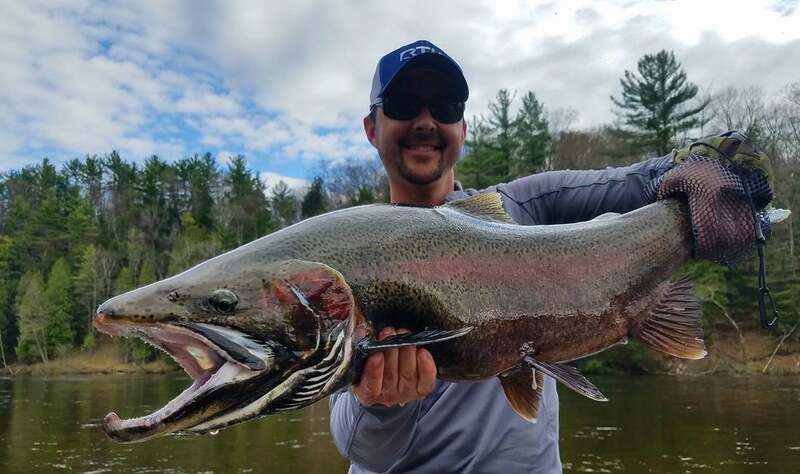 Within the next several weeks, we should start seeing good numbers of King (Chinook) Salmon in the Lower sections of the Pere Marquette and Big Manistee River. Salmon fishing should be excellent this Fall season with good catches from charter boat captains on Lake Michigan. Stacey with a gorgeous buck from this morning. 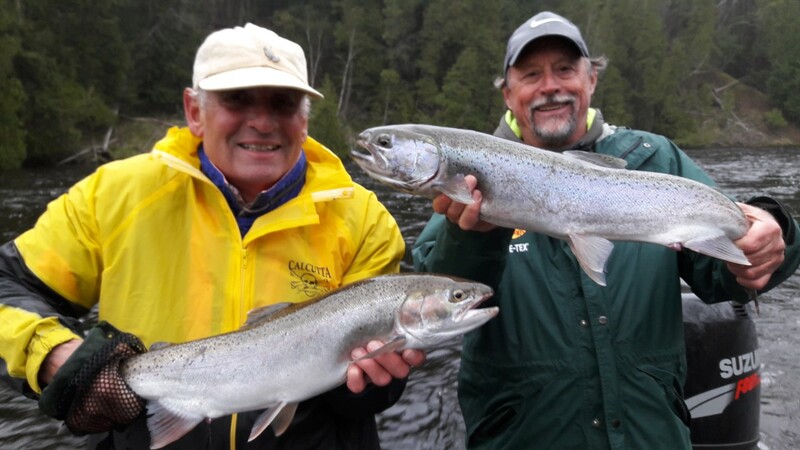 May should offer excellent Steelhead Fishing! These guys finished our morning half day with a double while floating back to the launch. Chrome drop back hens. 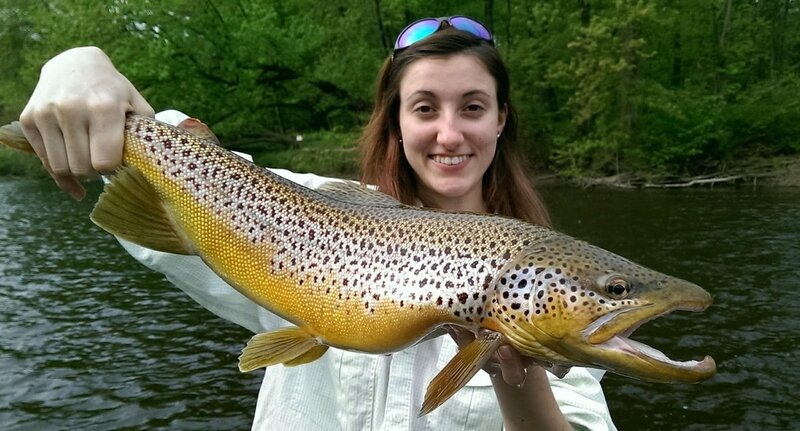 Ashley with a gorgeous Brown Trout from the Muskegon River. Sucker Spawn time is almost here! Spring Steelhead, Chinook Salmon, or Trout on Light Tackle Gear or Fly Fishing. 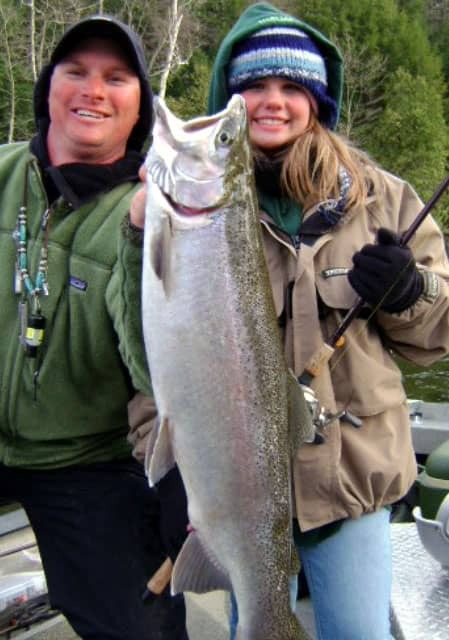 Fish for Michigan Steelhead, Trout, or Salmon on the famed Muskegon, Pere Marquette or Big Manistee. Spring Steelhead ascent the Muskegon River in early March, and April. Chinook and Coho Salmon enter Western Michigan Rivers in late August – September, offering exceptional angling opportunities. Fall Steelhead come in shortly after, typically late October – November. Trophy Brown and Rainbow Trout are available year around on the Muskegon River. Spring Steelhead & Trophy Trout on Light Tackle Gear or Fly Fishing. Spring is a wonderful time to be on the water! Chase brilliantly colored Brown Trout, or Rainbow Trout during the Michigan Sucker spawn! There are many fishing options, Fall Steelhead. Chinook Salmon, acrobatic, chrome Steelhead. No other time of year offers such wonderful fishing opportunities like Spring in Western Michigan. It’s a great time to be on the water with nice weather and great fishing! We fish steelhead a varity of different ways. Our two favorite techniques are light spinning tackle with floats and spawn, (real salmon eggs) Another is fly fishing trout beads on a float line along side the boat. Both styles produce a lot of Steelhead and Trout. Best Fly Fishing in Michigan! Chinook salmon on the fly! Fall Is on it’s way! Don’t wait till it’s too late to book your trophy Fall Chinook Salmon, Brown Trout, Steelhead, or guided Coho Fishing Trip! $350 full day. $250 half day. Guided Light Spinning & Fly Fishing Adventures for Steelhead and Trout on the Muskegon River, White, Big Manistee, Pere Marquette, and Au Sable Rivers. Call or Text (231) 519-7348 …. Contact us to reserve a date! Updated daily Fishing Reports & Stream flow data for the fish we seek and the rivers that we love!Fishing conditions now! 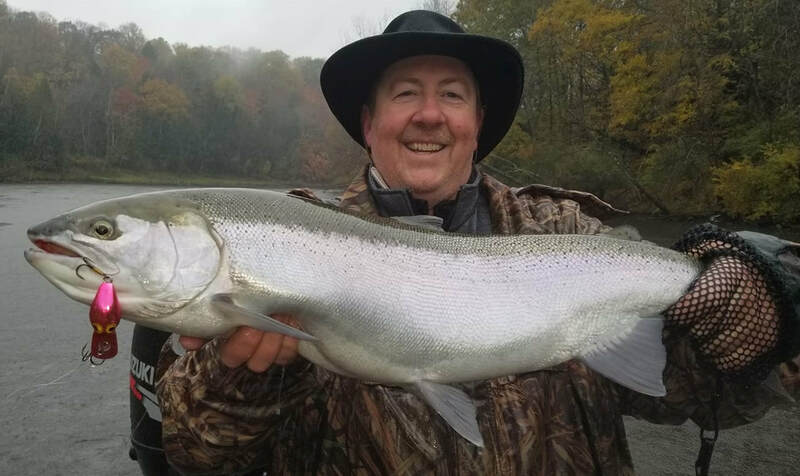 Michigan Steelhead Fishing – Steelhead is the crown jewel of Michigan Rivers – NOTHING in fresh water fights as hard as chrome bullet Fall steelhead on light tackle. Steelhead ascend the rivers beginning in mid October, November, then winter over in the river, ( December, January, February) Winter Steelhead feed heavily throughout the winter months and stage until the Spring Steelhead season, (March, April, And May) Skamania Steelhead are available during June, July August on the Manistee and St. Joseph Rivers. Muskegon River fishes best, November through late May. 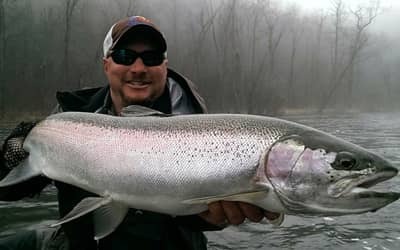 We offer three phenomenal techniques for Michigan Steelhead Fishing, Float fishing with spinning gear, Center pin float fishing, and fly fishing free style nymphing. We also specialize in Alaska style bead fishing for steelhead and trout. Float fishing trips are best during Fall, Winter, and early spring Steelhead. Fly fishing is best in April and May for spawning fishing on gravel. We supply all the gear, tackle, and flies for guided trips. Everything is included in our guided fishing trips. BIG 22lbs Spring Steelhead on the Muskegon River. The Might Muskegon River (Newaygo, MI) is located 45 minutes North of Grand Rapids, and offers exceptional trout fishing throughout the year. Rainbow trout, Brown trout, and smallmouth bass. Trophy Brown Trout fishing on Michigan’s Muskegon River. Fantastic dry fly fishing on the Muskegon River with epic hatches, big numbers of rainbow trout, brown trout, and steelhead. Emerging Caddis every evening with tons of rising trout. Come fish Michigan’s best kept secret – Muskegon River Trout Fishing . Evening “Hatch Masters” Michigan Trout specials going on now! $250 for an afternoon – evening of great Gray Drake, and Caddis hatches, entomology lessons, casting, and all around great trout fishing. Work all day, then hit the river for an evening hatch! June evening hatch trout trips on the Muskegon & Manistee Rivers. Morning Half days also available. Fly Fishing for trout is a great way to spend the day. Gorgeous Muskegon River Brown Trout. May. 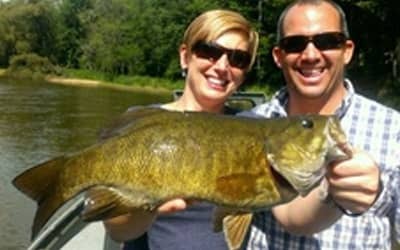 The hotter the better, Muskegon River Smallmouth Bass fishing on the upper and lower sections near Maple Island, Bridgton, and Newaygo offer some world class river smallies on light tackle. Hot summer days in July and August offer explosive top water action for warm water species. Northern Pike, Walleye, Musky, Largemouth, and trophy Smallmouth on a scenic and wild river in Northern Michigan. 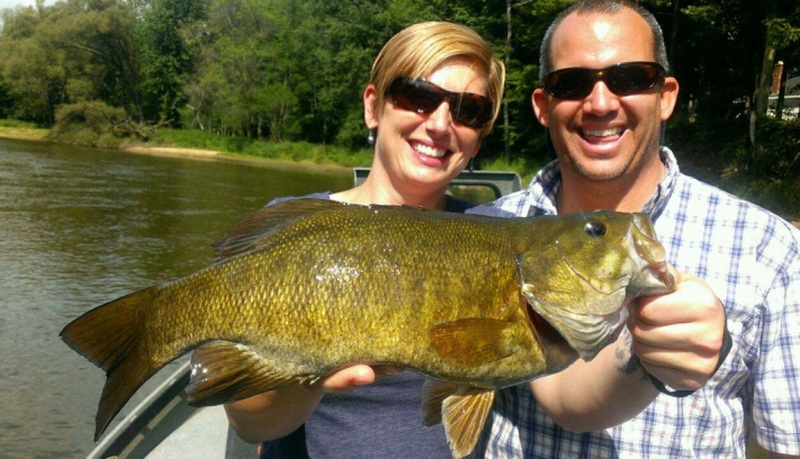 Conventional tackle guided tours seems to work best when hunting trophy Smallmouth. Top water fishing offers heart stopping bites from aggressive fish. Soft plastic baits also work exceptionally well. 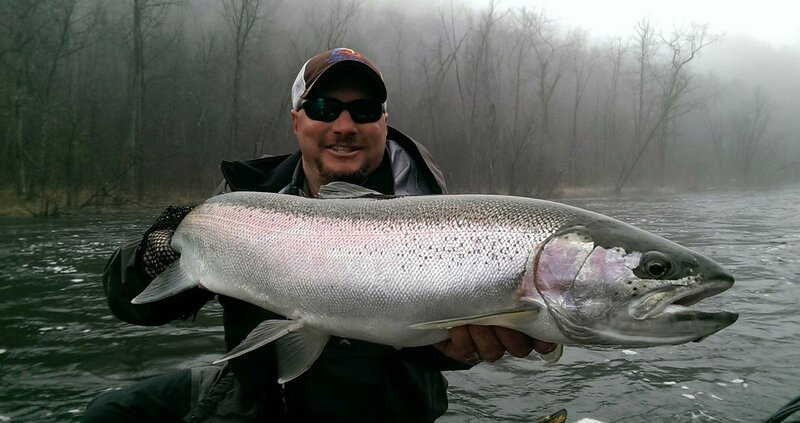 Over the past few days steelhead fishing has been heating up! Lots of new fish have entered the river making for some outstanding fishing trips in Michigan, Muskegon River. Out Steelhead guides have been doing well using floats (bobbers) and spawn sacks. Fly fishing has also been great. Free style nymphing has been very productive. Stone flies and small egg patterns have been working best for getting anglers in numbers of trout and steelhead. We have landed some great fish over the past three days. Brown trout, Steelhead, and walleye have been our main fishing targets. We have been doing great on the Pere Marquette, Manistee, and Muskegon Rivers for Michigan Steelhead Fishing. Our guided fishing trips are all inclusive. All gear, tackle and flies are provided. We offer light spinning tackle, centerpin, and baitcaster fishing for fall and winter steelhead. We provide quality TFO Fly Fishing equipment, rods, reels, tippet, leaders, what ever you may need for steelhead, salmon, smallmouth bass and trout. We have custom 18′ Headwater Jet Boats & Hyde Drift Boats. These boats are top notch, clean, spacious, and above all comfortable. Heaters are included during the winter months. 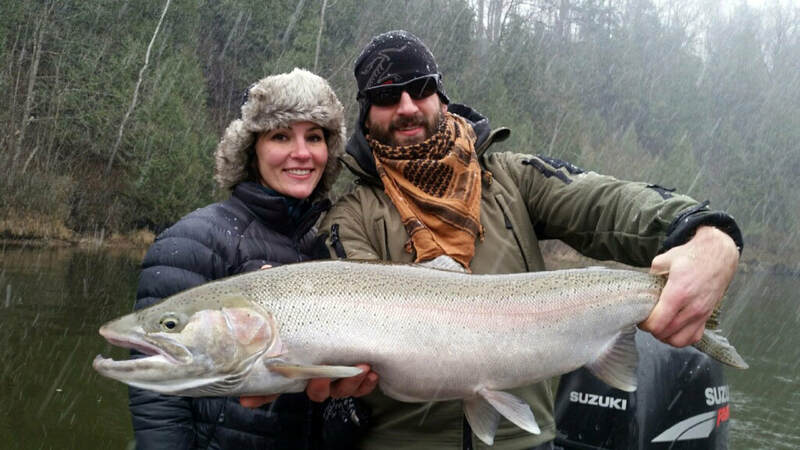 We guide year round for Salmon, Trout, Steelhead, and Smallmouth on Michigan’s finest rivers! Professionally Endorsed Fly Fishing Outfitter since 1996.